Choose what screensaver runs on your Mac during charging and when on battery. Is there a better alternative to Energy.saver? Is Energy.saver really the best app in Screen Savers category? Will Energy.saver work good on macOS 10.13.4? 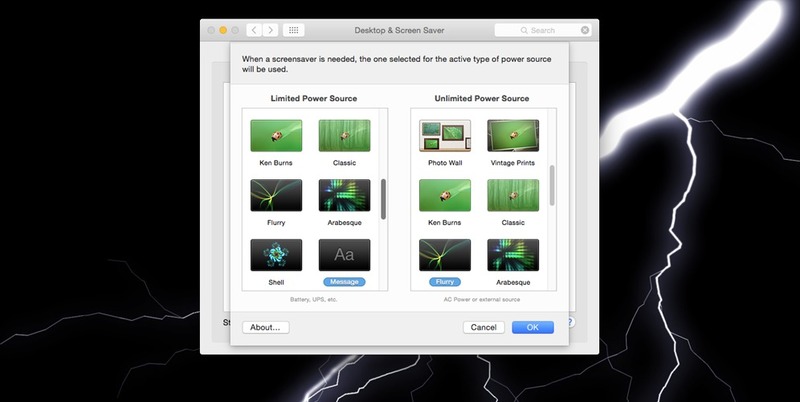 Energy.saver lets you define which Screen Saver should be run when your Mac is connected to a power source and which one to run when your Mac is running on battery. For instance, when running on battery, you may want to run the "Message" screen saver which consumes less CPU and GPU. And when plugged to a power source, you can select to run one of the intensive GPU Screen Savers installed on your Mac. Energy.saver needs a review. Be the first to review this app and get the discussion started! Energy.saver needs a rating. Be the first to rate this app and get the discussion started!